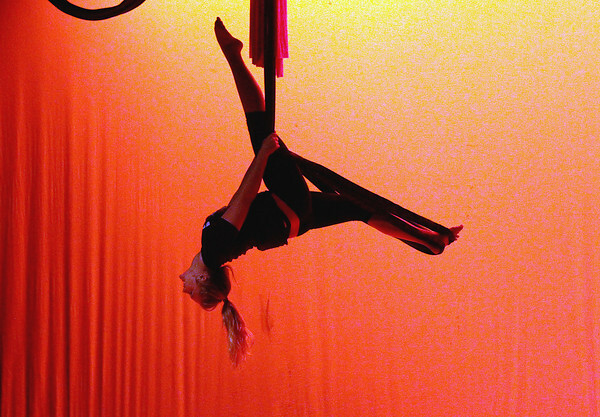 Traverse City West senior Jessica Golota (cq) performs in slings as she and other TCAPS students rehearse their routines for this weekend's Starfish Circus performance at the Traverse City West Senior High School Auditorium. Students from kindergarten through 12th grade spent several weeks working with performers from Aerial Angels, a Kalamazoo-based which spends its winter months working with camps and schools, in developing their own performances ranging from juggling and acrobatics to clowning and trapeze. Performances will be held Saturday, April 20 at 2 p.m. and 7 p.m.